Get the most out of your holiday with this jam-packed, adventure filled itinerary. You'll want to book in to one of our comfy hotels to lay your head after your action-packed day of activities. We recommend you grab a self-contained unit with sweeping ocean views, perfect for a no-fuss early morning getaway to your next adventure. Try: C Bargara Resort for a sunrise over the ocean to take your breath away. Or try the Bundaberg Spanish Motor Inn, a favourite amongst visitors, for a friendly self-contained accommodation option in the CBD. The pièce de résistance of your experience, the Mon Repos Turtle Encounter, varies depending on when you decide to visit. The majestic turtle nesting runs around November – January, whereas the turtle hatchlings typically begin to appear around January – February to scurry down the beach to start their journey. Try: As our turtles are wild animals we cannot know exactly when each evening they will decide to show. We recommend you bring some playing cards, a jumper and maybe even a snack (food van is available). Now that you've got turtle fever it's time to take it to the next level. 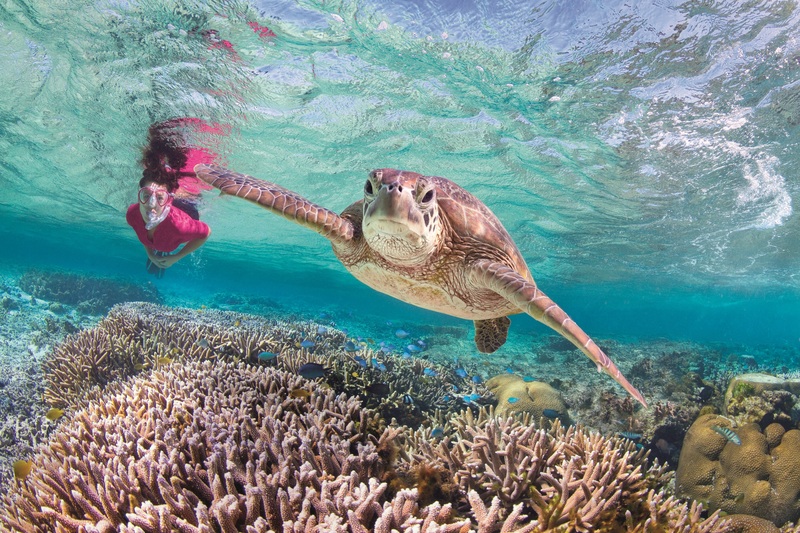 Come experience the pure magic of the Southern Great Barrier Reef out at our islands, Lady Musgrave and Lady Elliot Island, with white sand beaches and gorgeous clear blue reefs offering the perfect setting to swim with the turtles all year round. Try: Spend the day on the reef with Lady Musgrave Experience's day trip from Bundaberg Marina, or fly from Bundaberg airport to Lady Elliot Island Eco Resort for a day, or longer. You can't adventure with an empty stomach and here in the Bundaberg North Burnett Region, we know how to serve our local, fresh and abundant produce so you never feel hungry! Whether it's trying our award-winning locavore cafes, hopping from roadside stall to roadside stall collecting your own ingredients, or buying seafood fresh off the trawler, Bundaberg North Burnett's abundance will keep you on your toes. Try: Experience the full 'Farm-to-table' journey on a Bundy Food Tour. Go behind the scenes at local farms and meet the farmers who run them and take home the pick of the local produce along with a farmer's recipe. Bundaberg is famous for its rum pioneers, but its artisan drinks are making a splash internationally too! Spend a day creating, tasting, and learning about everything that is brewed, distilled and bottled here in the Bundaberg North Burnett Region. Try: Start at the world famous Bundaberg Rum and try your hand at the 'Blend Your Own Experience'. Head to 'The Brewhouse' for lunch and try a wide range of locally brewed craft beer by Bargara Brewing Company. Try Kalki Moon Distillery's award winning gin and vodka, or head to Childers to try the local wines and liqueurs! If you have time, you must make the 90 minute trek to the twin towns of Agnes Water and 1770. Take a ride on the iconic pink LARC, a hybrid boat/car, that travels along the coastline of Eurimbula National Park in the Southern Great Barrier Reef offering magnificent views of Round Hill Head and Bustard Bay. Try: Get adventurous and go sandboarding down the massive sand dunes into the bright blue waters.